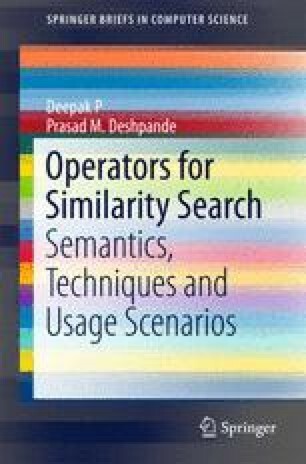 In this introductory chapter, we consider the operation of common similarity search systems, more from a semantics point of view as opposed to the efficiency-oriented view as used in typical database literature. We illustrate that the full-specification of a similarity search system involves the schema definition as well as details pertaining to the phases of pair-wise similarity estimation and result set identification. We will see how variations in the specification of pairwise similarity estimation and result set identification give rise to various similarity operators. In addition to reviewing the most common similarity operator, the top-k operator, we look at the landscape of similarity operators that have been proposed in the last two decades. We then consider the notion of similarity from a cognitive/psychological perspective and outline some assumptions of similarity measures that form conventional wisdom in such literature. In particular, we focus on those aspects that have implications to building computer-based similarity search systems, and outline some disconnects between the literature in psychology and that in computing pertaining to assumptions made about similarity measures.